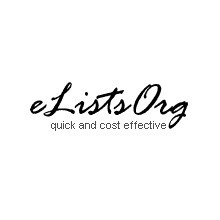 eListsorg is one of the best email provider for US, UK, Canada and Australia Online Marketers. eListsOrg helps companies increase sales and customer loyalty through its high-value data and innovative multi-channel digital and offline marketing services. We have grown to become a leading business assistant to hundreds of small, medium and large organizations, across various sectors. For instance we cater to technology, education and healthcare industries. At the same time we excel in providing specialized lists for C and V level officials, judiciary department, Fortune 500 companies, and the list goes on. We aim to deliver comprehensive information about those companies, industries and people that drive the business, along with powerful tools to reach and connect to the right business/ prospect, industry and get business done. So find and gain new customers and target new markets and strategic locations by making use of eListsOrg’s extensive database.